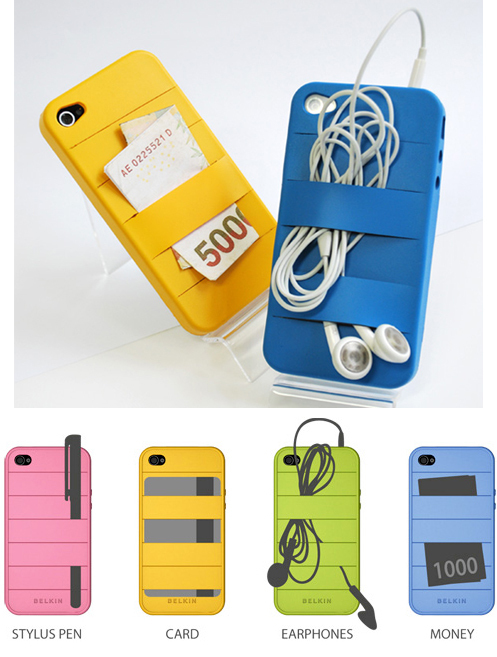 The Elasty iPhone 4 case isn't made by Belkin quite yet, but the design concept will surely bring this case to life sooner rather than later. Inspired by rubber bands, the Elasty is a rather slim silicone rubber case with 5 ribbon-like slots on the back that stretch to hold your credit card, in-ears a few bills and whatever you can possibly tuck under them. case It's one of the more useful cases that we've seen in these past years and apparently Belkin thinks that too. Elasty's clever design has won the Korean Belkin Design Awards.